It’s been an eventful start to our trip so far! Our plans got sidetracked almost immediately; we were supposed to meet in Rio on Sunday morning, but I arrived in Seattle to a text from Delta informing me my flight into Rio had been delayed by 8 hours. I called customer service and they told me the flight had been rescheduled due to an ash cloud that was approaching Rio from Calbuco volcano in Chile, which has been erupting over the past few days. However, the ash cloud apparently moved out to sea and Emily’s flight on United took off without too much delay. Even my pilot admitted Delta was a little over-cautious canceling a 10 hour flight so far in advance. As a result, I ended up spending my first night in a hotel in Atlanta and got up early Sunday morning to catch my delayed flight. It definitely could have been worse, but I was annoyed with Delta, who wouldn’t supply hotels to their passengers. When I arrived back at the airport I was surprised to find half of the passengers sleeping on the floors all around the gate. I ended up missing a full day in Rio, but we made the best of it and had a nice dinner outside under the Lapa Arches when I arrived, where we were accompanied by some local musicians. We tried a few Brazilian appetizers, which were all delicious. We had these cassava balls fried with cheese, pumpkin baked with cream, and these meat pastries. 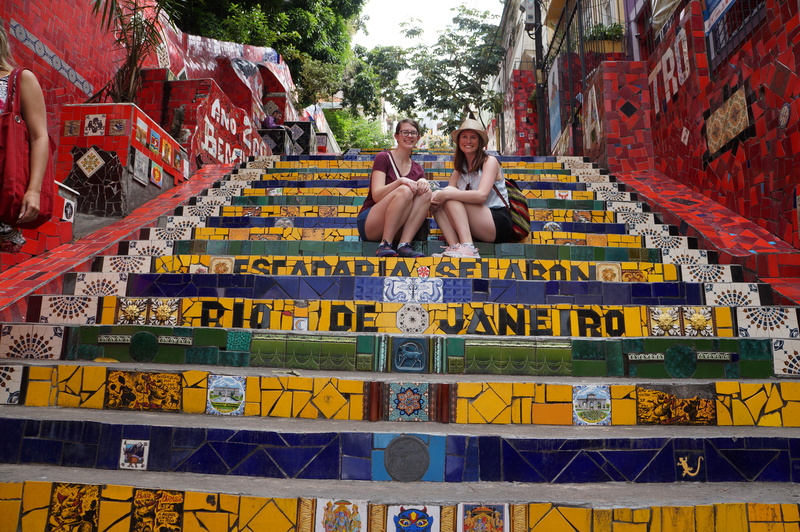 On our first full day in Rio, we decided to go on a walking tour to get acquainted with the city. Rio is absolutely enormous and split into a number of neighborhoods. We were staying near Centro, the oldest part of the city, in Lapa. The Portuguese first arrived in Brazil in 1500 and starting building the city from Centro. Rio de Janeiro literally translates to January River. It’s named because it was “discovered” on January 1st, but it’s a bit of a misnomer because the river the Portuguese were referring to is actually Guanabara Bay (which is also funny because Guanabara means bay in the native language, so the Portuguese accidentally named it “Bay Bay”). Our tour guide took us all around the city centre, starting at Largo da Carioca, a square near the downtown. We stopped at the famous Confeitaria Colombo bakery for some delicious treats and visited 15th Square, the Imperial Palace, and vibrant Cinelandia, home to the theatro municipal, city hall, and the museum of fine arts. Towards the end of the tour we stopped into Havaianas, Brazils premier flip flop shop, before finishing at Escadaria Selaron, a set of stairs located at the base of Santa Teresa. Rio is located in the mountains and large parts of the city extend up into the hills. The neighborhood of Lapa borders Santa Teresa, which is located along the mountainside near the Corcovado. Escadaria Selaron starts in Lapa and ascends up into Santa Teresa. The steps were made famous by Chilean artist Jorge Selaron, who decorated more than 200 steps with colourful tiles of green, blue, and yellow for the Brazilian flag. The steps are incredible because partway through the project he ran out of money, but instead of asking for grants, he asked for people to donate tiles. The steps are now covered in tiles from all over the world and bring pride to the neighborhood of Santa Teresa. The mountainside neighborhoods are actually an important part of Rio’s class system, which is largely split between the wealthy and the poor. The city originally expanded north from Centro before the wealthy eventually started developing the city in the south zone along the beaches. When slaves were freed in Rio in the mid 1800’s, many of the wealthy kicked them off their properties and with nowhere else to go, they started living in shanty towns up the sides of the mountains. These shanty towns now form Rio’s slums, or favelas, with the exception of Santa Teresa. They’re a defining and important part of the city, but the juxtaposition of the favelas against the beachside resorts really demonstrates Rio’s class disparity. We had planned to take the tram up the Corcovado to see Christo Redentor in the afternoon, but when we arrived, we were told that it was clouded in at the top. We decided to visit the Jardim Botanico at the base of the mountain instead. Evidently the clouds didn’t stick around too long though because we had a great view of Christo Redentor from the garden. 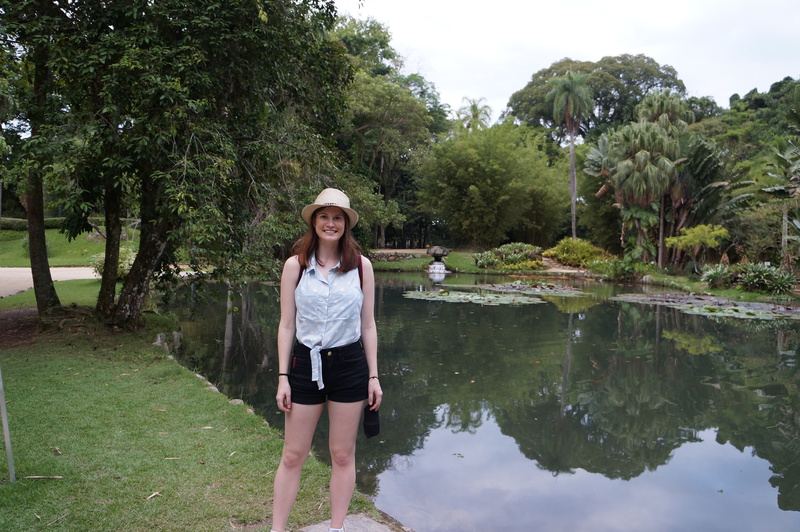 The Jardim was gorgeous and we spent an hour exploring all the different plants and animals we could find (based on its size, I’d call it more of a park than a garden). We saw tons of green macaws flying overhead and a great egret hanging out in the water, but our favourite was a group of tiny little marmosets that we saw jumping around in the trees! We finished off the day with a huge bowl of Feijoada, Brazil’s national dish. It’s a meat stew cooked with black beans and served with rice. The flavour of the stew was delicious (so was the sausage in the stew), but we were surprised at the huge quantities of meat fat and gristle in the stew, so it wasn’t one of our favourites. Emily’s been eating vegan for the last few months, but she’s taking a break in Brazil. Lucky for me because Brazilians are huge meat lovers! 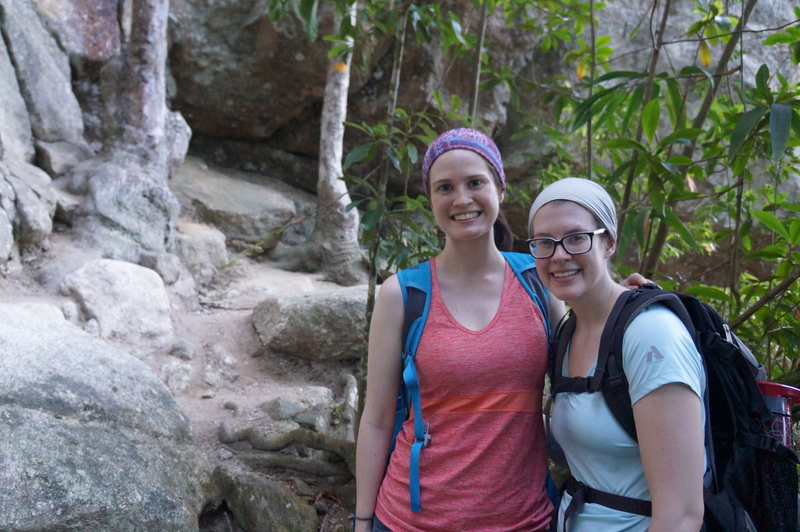 On our second day we left the city and had a wonderful day hiking in Tijuca National Park, one of Rio’s urban forests. Even though the park is surrounded by Rio, it’s so large that once you enter you feel as though you’ve completely left the city behind. We went into the park with our wonderful guide, Ed, as a party of six. The tour we were doing was called peaks and waterfalls and we started off visiting a few viewpoints and one of the parks many waterfalls. Unfortunately, Rio has been experiencing dryer summers lately and many of the waterfalls have been drying up. Ed was happy that the first waterfall we visited was almost up to it’s normal flow. We started hiking around 11am and spent about 5 hours in the jungle. We first hiked to Pica da Tijuca, which was thought to be the highest peak in Rio for many years, up until they got GPS and realized that another peak was 6 meters higher. Tijuca is still the most beloved though! We hiked up through the jungle for about 400 meters in elevation until we reached a set of stairs carved into the stone. The steps ascend along the side of the mountain to the peak. They were constructed in the early 1900’s in preparation for a visit from the king of Belgium. The king loved adventure and rock climbing, so they decided to build the steps to show him one of Rio’s best views. However, the king loved rock climbing so much that he was disappointed to see the steps and instead used ropes to climb up the mountainside parallel to the new stairs. We opted to take the steps. 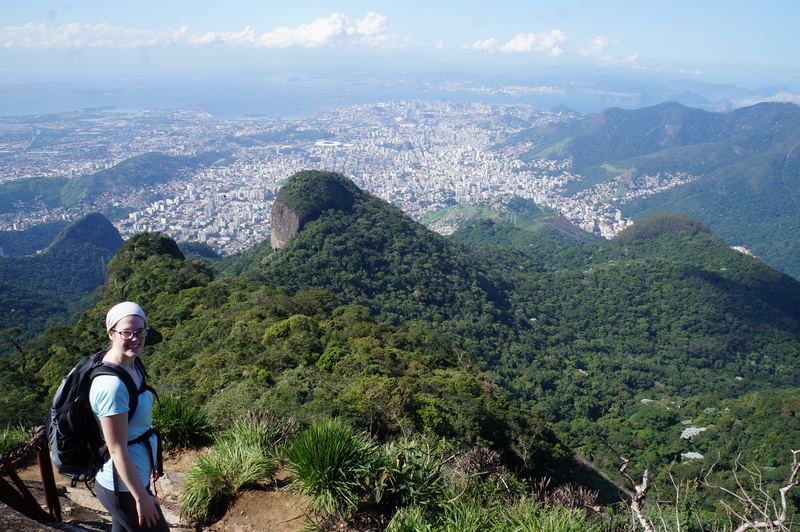 It was a pretty steep and scary climb and Ed told us to strictly watch our feet as we went, so when we finally stopped and he told us to turn around, we were privileged to the most amazing view of Rio! We could see the city sprawled out beneath us, with Guanabara bay and the city of Niteroi behind it. We ate our lunch at the top while enjoying the beautiful view. We were literally above the clouds, so the other side of the peak was clouded over when we reached the top. Fortunately, they cleared out just before we left and we had another incredible view of the rolling hills and peaks of Parque da Tijuca, all the way out to the Atlantic Ocean. After lunch, we hiked down to Tijuco Mirim, the pico’s smaller, but no less impressive, cousin. The rest of the hike took us down around the back of the peak, but we enjoyed it even more than the hike up. The path was much wilder and parts of the trail followed the bare rock of the peak. We saw a few hummingbirds, another marmoset, a snake, and some enormous spiders on the way down. Near the end we stopped at another waterfall; unfortunately it had been reduced to mostly just sprinkles, but it was nice to stand under to cool off. Even though it’s autumn here, we are finding it pretty hot and humid. But we should count ourselves lucky because we’ve been informed that Rio has two seasons: summer and hell. Temperatures can go into the high 40’s during Rio’s summer. Ed had the perfect surprise for us at the end of the hike, ice cold Antarctica beer, one of Rio’s local beers. A cool beer never tasted so good! It feels weird to be leaving Rio already since we haven’t done that much yet. We checked out of the hostel this morning and flew to Iguazu Falls for the next few days. I can’t wait to experience the waterfalls tomorrow though and we’ll be back in Rio soon enough! Unfortunately I wasn’t able to upload any photos to share, but they’ll all make it to Facebook when I get back!